Over the past decade, the US has used the unmanned systems in Iraq and Afghanistan. It is using drones in Syria and Libya to counter terrorist outfits. Germany has funded efforts to develop critical UGV technologies, including human interface, planning, intelligent control, perception, and autonomous robotic vehicle platforms. Australia is concentrating on the areas of platform-related technologies and weapons. It is also focusing on the development of man/unmanned formations, control theory, and control systems. Israel is already well-known for its UAVs and has started collaborating with India in this area. It is also directing efforts towards tank systems and laser rangefinders. UAE has agreed to a contract to purchase eight P.1HH Hammerhead unmanned aerial vehicles equipped with EO/IR (Electro-Optical Infra-Red) cameras, radar and communications systems from Piaggio (Italy). The Desert Hawk mini-UAV is used by the British Army in Afghanistan for ISR missions. Which type of border security systems are in great demand? How the industry players are investing in technology and product innovation? 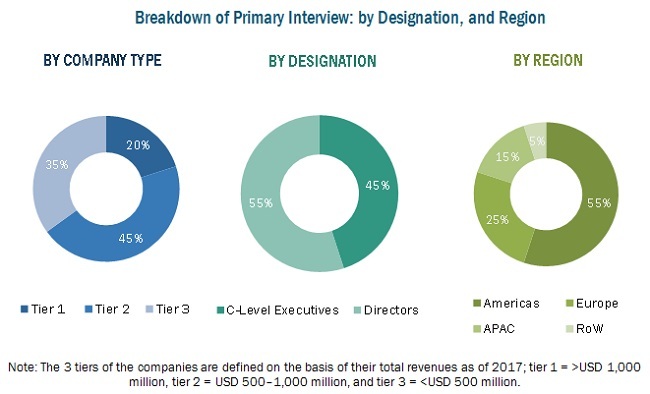 What are the key organic and inorganic growth strategies being adopted by the industry players to grow in the border security system market? What are the key opportunities to grow in the border security system market? In March 2016, Rockwell Collins was awarded a contract by the Peruvian Navy to install Talon V/UHF tactical radio system on its SH-2G Super Seasprite helicopters. The Talon radio would provide secure voice and data communication capabilities to support the various missions of the SH-2G platform, including surface and sub-surface maritime, blue water and littoral surveillance, and search and rescue operations. In February 2016, Raytheon upgraded the combat-proven Patriot Air and Missile Defense System. The Patriot radar main array was enhanced with gallium nitride- (GaN) based, Active Electronically Scanned Array (AESA) technology. The projected upgrade delivers 360-degree capability and keeps Patriot ahead of increasingly more sophisticated threats, such as aircraft, drones, and cruise and ballistic missiles. In February 2016, Israel Aerospace Industries Ltd. and Hankuk Carbon, a Korean composite manufacturer, signed a Memorandum of Agreement (MOA) to establish a joint venture to develop, manufacture, and sell vertical take-off and landing (VTOL) UAV. “The study answers several questions for the target audiences, primarily, which market segments to focus on in the next two to five years for prioritizing the efforts and investments”. Others (RF Jammers and Microwave intrusion detection systems). Company Profiles: Detailed analysis of the major companies present in the Border security system market. The global Border Security system market is expected to reach USD 52.95 billion by 2022. It is projected to grow at a CAGR of 7.16% between 2016 and 2022. The main drivers of this growth are need for advanced technology security systems and the rising territorial conflicts and geopolitical instabilities. The use of Border Security system is going to increase exponentially in the future because of rising territorial conflicts, terrorism and geopolitical instabilities along with the need of advanced technology Border Security Solutions. The APAC market is expected to grow at the highest rate due to the the increased investment for strengthening the surveillance and weapon guidance capabilities by China, India and Japan, and increased spending of governments to tackle terrorist attacks, infiltration, illegal immigration and criminal activities. Unmanned vehicles in Border Security system will be the largest revenue maker among all, as these systems help in unprecedented situational awareness, precision targeting, communications relay delivery for fighting and defeating threats in difficult terrains and most demanding and unknown environments without risking human life, no crew to limit its range and endurance and the fear of being captured. Biometric systems are expected grow at a CAGR higher than any other Border Security system between 2016 and 2022 due to adoption of Biometric systems on a large scale to tackle illegal immigration, human trafficking, among others. Schemes such as development of national IDs, e-passports, and e-visas are expected to be the main drivers for it. In the Border Security system market report, Ground based systems account for the largest percentage share. The major challenges faced by ground border security are conventional international disputes, cross-border infiltration, illegal migration, smuggling and other forms of criminal activity. Ground border security is aimed at safeguarding lawful trade and travel and disrupting and dismantling transnational criminal and terrorist organizations on land. 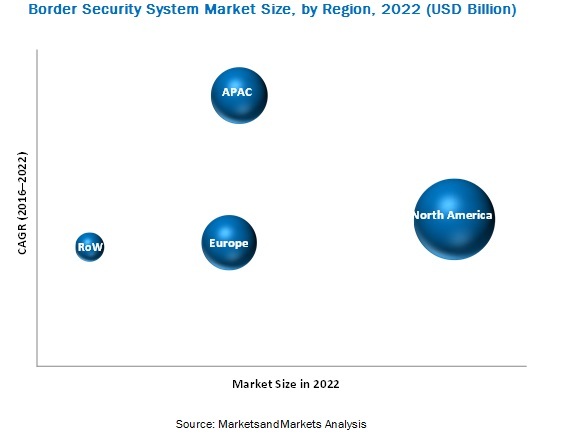 In terms of the different geographic regions, North America holds the largest share of the Border Security system market, and APAC market is expected to grow at the highest CAGR between 2016 and 2022. The major driver for the APAC market is the increased investment for strengthening the surveillance and weapon guidance capabilities by China, India and Japan, and increased spending of governments to tackle terrorist attacks, infiltration, illegal immigration and criminal activities. Ground border security is aimed at safeguarding lawful trade and travel and disrupting and dismantling transnational criminal and terrorist organizations on land. The ground–based security systems include buried cable/buried sensors, ground surveillance radar (GSR) systems, CCTV and thermal imaging IR detection camera systems, perimeter intrusion detection systems/ intelligent fencing systems, unmanned ground vehicles (UGV), biometric systems, RF jammers, and microwave intrusion detection system among others. Aerial security systems perform security-aimed intelligence, surveillance, and reconnaissance operations with the help of airborne vehicles. Aerial security systems help in border management by scouting and reporting emergencies, monitoring accidents and crimes, surveillance of a certain landscape area, operating in highly busy areas , detecting vehicles and pedestrians, as well as their tracking from the sky, detecting low-observable air, sea, and ground objects, and so on. The aerial-based security systems include the use of air surveillance radar (ASR) systems, military aircraft and helicopters, unmanned aerial vehicles (UAV), among others. Maritime borders are vulnerable due to proximity to critical infrastructures, such as ports, oil refineries, space stations, atomic power plants, and naval bases. Underwater security systems one of the most important aims is to detect, identify, track, and generate warning for all types of surface and underwater threats. Underwater security systems include submarines, autonomous underwater vehicles (AUV), advanced coastal surveillance radars, underwater inspection system among others. One of the main restraints of the Border Security system market is the falling crude oil prices along the globe thus hampering the defence expenditure of some countries for a temporary period. To balance this situation the some oil producing countries are resorting to cut in annual budgets, planning to limit the defence expenditure in some areas for a temporary period of time until the oil prices are stable again. 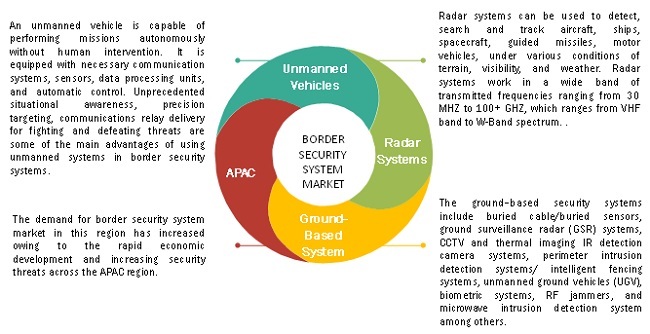 The major players in the Border Security system market are Lockheed Martin Corporation (US), Raytheon company (US), Northrop Grumman Corporation (US), Thales (France), BAE Systems (UK), Flir systems (US), and Elbit systems (Israel), among others. 11.10 Israel Aerospace Industries Ltd.
11.15 Controp Precision Technologies Ltd.